Take a look at what your neighbors have been up to recently in our community. It’s that wonderful time of year. The one that immediately follows that other wonderful time of year … Girl Scout Cookie season of course! While some of us have visions of Thin Mints dancing in our heads, Republic Bank of Arizona Compliance Officer Angela Whitney (fourth from the right in the picture above) works behind the scenes to help the scouts and their leaders understand the financial responsibilities associated with their notable fundraising experience. 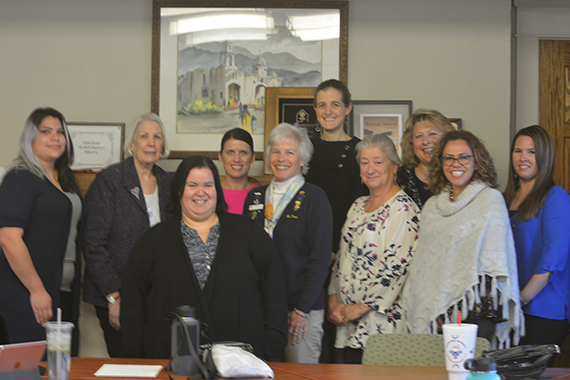 Angela is a volunteer with the Girl Scouts Arizona Cactus-Pine Financial Literacy Circle, a team of financial experts working to increase the girl scouts’ confidence in their ability to make financial decisions. Angela has been a Financial Literacy Circle volunteer for four years. When Republic Bank of Arizona CEO Ralph Tapscott asked if she would be interested in participating in the circle, she jumped at the chance. “I love it,” says Angela. “I was a Girl Scout, and later a Girl Scout leader for five years.” It’s extremely rewarding for her to be able to offer her skills and expertise to enhance the lives of these girls and young women. While Girl Scout cookie sales is a seasonal activity, the Financial Literacy Circle is at work year-round developing new programs and activities to teach and enhance financial skills. “The Girl Scout cookie program is the largest girl-run business in the nation, and I’m honored to serve as a resource for this amazing endeavor,” says Angela. As a community bank focused on serving local businesses, we understand the importance of giving back to the communities we serve. Customers and employees want to know that the businesses they patronize and work for have values that align with their own. But we also know we can’t just say we’re committed to our communities, we have to show it. While community involvement and participation has always been a company core value, we recently formalized it by instituting the Culture Club made up of five “go-getter” team members led by a member of executive management. The Club has an official Manifesto with clearly outlined goals and objectives. While we encourage participation by the entire staff, the Club members act as the inspiration, the collaborators and the leaders for the activities, which will include community outreach, as well as internal activities. Yes, that takes planning and effort, but it is well worth it. 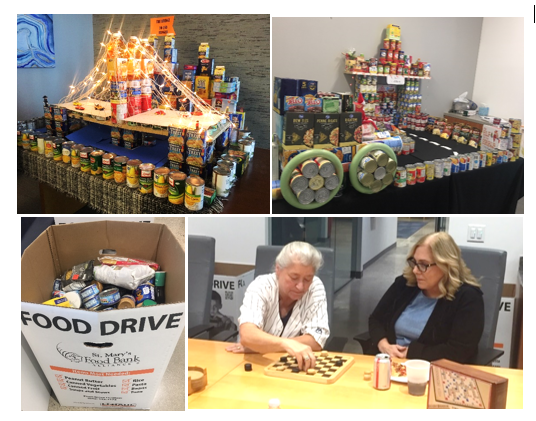 For our annual food drive, we create teams that compete for prizes, weekly events that require a food or cash donation to enter, and mystery prizes throughout the week to encourage ongoing food donations. And there’s nothing wrong with incorporating a little friendly competition to really spice things up. At the end of the drive, each of our teams build some type of structure with the food items collected, which is then judged. The winning team wins a fun prize. But most importantly, several pounds of food are donated to St. Mary’s Food Bank. Support those employees who participate for their own reasons by offering paid time off, if needed, to volunteer. Recognize their individual efforts by featuring their volunteerism in the company newsletter. Acknowledge their efforts at employee meetings and on social media so they see the impact of their involvement on others and feel the company’s support for their individual efforts. On occasion, we are asked by customers and shareholders to support specific activities important to them, and whenever possible, we will. For example, we formed walking teams for two very worthwhile organizations, NEEDA and UMOM, at the request of a shareholder and a customer. The Bank paid the employees’ registration fees and provided t-shirts to those who participated. Choosing causes that resonate with your employees, customers and shareholders is really a win-win, by supporting a great cause as well as the individual requesting your participation. And finally, and perhaps most importantly, management must lead by example. Our president and CEO has been a member of the Phoenix Rotary for 23 years, and participates in a number of community activities as part of that organization. Ralph and our executive team “walk the talk” by organizing and participating in our community support activities. Board Chairman Alan Sparks encourages and supports the Bank’s community efforts and has identified that as one of his priorities and chairman. While these steps have worked for Republic Bank of Arizona, building a caring culture takes commitment and energy, but perhaps most importantly, transparency. You cannot fake it. Businesses need to be genuine in their commitment to local communities. There are many, many ways you can help your local community. Find a cause that you and your employees can get passionate about, and go for it! The competition was fierce. The creativity was phenomenal. And the participation outstanding. It’s official … the Bank’s 2018 St. Mary’s Food Drive was a can-tastic success! This year’s annual event featured bake sales, potlucks, game day fun, family meal competitions, mystery food days, and the final event, the Can-struction competition. The events helped keep the (food) drive alive and resulted in six food drive boxes over-flowing with much-needed food items for families in need throughout the community. Bake Sales & Cake Walks – RBAZ staff baked up a storm and donated scrumptious treats to sell during the day and use for a cake walk. The entry fee to participate in the cake walk was, of course, donated food items. What a delectable idea! Game Day Fun – You could feel the competition in the air as staff members challenged each other to Scrabble, Jenga, checkers, Backgammon and more … but it was all in good fun. And you had to pay to play in the form of food drive can-tributions. Mystery Food Days – Each Tuesday, team leads would select one item from the list of most-needed foods as the “mystery” item. Whoever brought that particular item in that day won a prize. Family Meal Competition – Keeping the needs of the families in mind, the two food bank teams were challenged to present a themed meal from appetizers to dessert using the donated food items. The presentations were judged and the winning team won a prize for their Italian-themed meal. Can-struction Competition – The final event was a highly creative, fiercely competitive challenge to build a structure using donated food items. The two structures featured The Bridge to End Hunger and The Road to Bountiful. The two creative structures were judged and the winning team won a fabulous prize. In the end, the Bank’s donations totaled 930 pounds! That’s enough to provide 775 meals for hungry and food insecure Arizona families. Read more about how RBAZ has fostered a Caring Culture. Walking proudly in flip flops, the Republic Bank of Arizona's Community Service Team participated in the UMOM New Day Center Walk to End Homelessness on Saturday, September 22. The team not only helped raise awareness for those experiencing homelessness - we also made history. 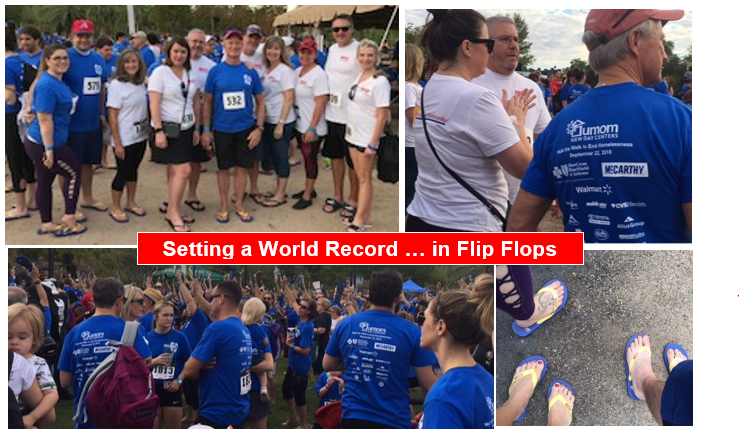 The walk at the Phoenix Zoo unofficially broke the world record for the largest 1k race in flip flops. The offical word will come in the next few months. Supporting our local community is one of our core values, and this was one fun way to do it. We thank all those who participated, including our team leader Nathaniel Spatz. We also want to thank client Karie Cowden, founder of Connect the Dots Promotions, for inviting us to take part in this worthwhile event to raise awareness and funds to help UMOM provide shelter, services, and affordable housing for families, single women and youth experiencing homelessness. I read recently that businesses should redesign their websites every few years. It took a bit longer for Republic Bank of Arizona to accomplish this. But we did it! Our new site launched in June. For many business owners, a website redesign is a laborious task that feels, at times, endless. But the process is definitely worth it. It’s a chance to reexamine how you want your business to be represented. For us, it was a great opportunity to update our website in step with our new name, new brand, and new location. While fresh from completing the process, we offer a few tips for businesses considering a website redesign of their own. Assuming you don’t have an internal web development team, find the budget to hire a website design company. We contracted with a company that develops websites specifically for financial institutions. With this contract, we get ongoing support with a dedicated account manager, quarterly analytics reports, technical support and more. An experienced vendor can guide you regarding best practices, changing trends, ADA requirements, security and regulatory compliance, and more. Shop around, get references, and conduct interviews. Your online presence says a lot about your company, so make sure it’s sending the right message. You, the business owner/CEO. Even if you’re not “creative” you know what you like, you know your brand, and you know how you want your company presented. Marketing liaison to work directly with the website vendor and the company decision makers to manage the timeline, collect feedback, provide content and design direction to the vendor, and generally keep the project on track. Legal/compliance representative, at least for final review and signoff. Internal IT support, if applicable. You don’t want to create a site the IT team can’t support. Any additional key executives or decision makers as you see fit. Keep this core team to a limited number of key members. Too much input and too many opinions can do more harm than good. This is another great benefit of working with the pros. They know the questions to ask the core team to get a solid understanding of the company, objectives for the website, website users, content, and overall design. These “deep dive” investigative sessions are priceless and should provide a great foundation for the website design team to get pretty close to an overall structure, look, and tone for the new site. Provide the vendor sample websites you like. For our site, we requested the vendor send us links to other sites they developed for financial institutions of a similar size and mission, from which we were able to give them feedback on what we liked and/or didn’t like. The site map outlines the architectural structure of your website. Make sure you understand it from top to bottom. Ask questions or view sample sites if needed. Once the site map is approved, the developers begin building and coding your pages. Making changes to the site map after it’s approved can be costly and can impact the timeline. In most cases, the website vendor will provide pdfs of your home page and several interior pages. It’s critical that the core team review these pages carefully, providing clear and detailed feedback to the marketing liaison, who will provide consolidated feedback to the vendor. This is the time to ensure the design and tone are on track. The development phase of the project will take several weeks. It’s a lengthy process those of us not in the IT world may not understand. Or perhaps the review process takes some back and forth to get the right look. For us, it was images that seemed to offer the most challenge. Be patient. The vendor wants to get it right, so stay with them. Providing feedback and approvals in a timely manner will help keep the project on track. Once the website is complete, make sure those assigned to keeping it up to date get the training they need. Once we received the development site to review, we did many of the content changes ourselves to get an understanding of the CMS. Ask for help understanding the analytics of the site as well. You’ll want to know how your new site is performing, compared to your previous site. Hopefully it’s positive, but if not, you may need to take a second look to determine why. o Drink water, more than usual, and avoid dehydrating alcoholic, sugary, or caffeinated drinks. o Wear lightweight and light-colored clothing. Businesses might consider relaxing the dress code if appropriate. o Monitor those with a higher vulnerability to heat, including small children. o Check on employees, family, friends, and neighbors, especially the elderly. o If engaging in outdoor activity, take longer and more frequent breaks and avoid the hottest parts of the day. o Provide complimentary bottled water for customers. o Recognize the signs and symptoms of heat-related illness.